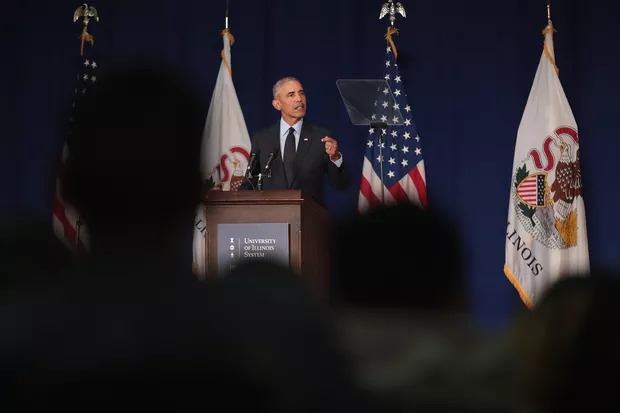 In his first press conference since the Boston Marathon bombing, President Obama defended the FBI and said Americans will continue to go on about their lives. In his weekly address, President Obama spoke to the American people about the act of terror at the Boston Marathon that wounded dozens and killed three innocent people on Monday, and said that through it all, Boston’s spirit remains undaunted and Americans have proven they refuse to be terrorized. This past week, first responders, race volunteers, doctors and nurses, and the good people of Boston joined together to show the world how Americans respond to evil: with resilience and resolve, and without fear. And that’s the way Boston and America will move forward together. After a daylong manhunt that saw police searching door-to-door through Boston, law enforcement officials captured the remaining suspect believed to be responsible for Monday’s bombing at the finish line of the Boston Marathon. He was ultimately found in Watertown, Massachusetts. THE PRESIDENT: Good evening. Tonight our nation is in debt to the people of Boston and the people of Massachusetts. After a vicious attack on their city, Bostonians responded with resolve and determination. They did their part as citizens and partners in this investigation. Boston police and state police and local police across the Commonwealth of Massachusetts responded with professionalism and bravery over five long days. And tonight, because of their determined efforts, we’ve closed an important chapter in this tragedy. I’ve been briefed earlier this evening by FBI Director Mueller. After the attacks on Monday, I directed the full resources of the federal government to be made available to help state and local authorities in the investigation and to increase security as needed. Over the past week, close coordination among federal, state, and local officials — sharing information, moving swiftly to track down leads — has been critical to this effort. They all worked as they should, as a team. And we are extremely grateful for that. We owe a tremendous debt of gratitude to all our outstanding law enforcement professionals. These men and women get up every day, they put on that uniform; they risk their lives to keep us safe — and as this week showed, they don’t always know what to expect. So our thoughts are with those who were wounded in pursuit of the suspects and we pray for their full recovery. We also send our prayers to the Collier family who grieve the loss of their son and brother, Sean. “He was born to be a police officer,” said his chief at MIT. He was just 26 years old. And as his family has said, he died bravely in the line of duty, doing what he committed his life to doing — serving and protecting others. So we’re grateful to him. One thing we do know is that whatever hateful agenda drove these men to such heinous acts will not — cannot — prevail. Whatever they thought they could ultimately achieve, they’ve already failed. They failed because the people of Boston refused to be intimidated. They failed because, as Americans, we refused to be terrorized. They failed because we will not waver from the character and the compassion and the values that define us as a country. Nor will we break the bonds that hold us together as Americans. That American spirit includes staying true to the unity and diversity that makes us strong — like no other nation in the world. In this age of instant reporting and tweets and blogs, there’s a temptation to latch on to any bit of information, sometimes to jump to conclusions. But when a tragedy like this happens, with public safety at risk and the stakes so high, it’s important that we do this right. That’s why we have investigations. That’s why we relentlessly gather the facts. That’s why we have courts. And that’s why we take care not to rush to judgment — not about the motivations of these individuals; certainly not about entire groups of people. Finally, let me say that even as so much attention has been focused on the tragic events in Boston, understandably, we’ve also seen a tight-knit community in Texas devastated by a terrible explosion. And I want them to know that they are not forgotten. Our thoughts, our prayers are with the people of West, Texas, where so many good people lost their lives; some lost their homes; many are injured; many are still missing. I’ve talked to Governor Perry and Mayor Muska and I’ve pledged that the people of West will have the resources that they need to recover and rebuild. And I want everybody in Texas to know that we will follow through with those commitments. All in all, this has been a tough week. But we’ve seen the character of our country once more. And as President, I’m confident that we have the courage and the resilience and the spirit to overcome these challenges — and to go forward, as one nation under God, indivisible, with liberty and justice for all. Political Headlines April 18, 2013: How much grief can we and President Obama take? How much grief can we and Obama take? THE PRESIDENT: Thank you. Thank you, everybody. Well, listen, we just had a wonderful interfaith service, and I want to thank Governor Patrick for helping to organize that. I want to thank both the Governor and your extraordinary Mayor, Tom Menino — (applause) — for the incredible leadership and cool under pressure, the organization, the mobilization and the courage that they have shown reflective of this great city and reflective of this great Commonwealth of Massachusetts. Now, I’m not going to speak long. I’m just — he started calling me Reverend Obama, so I know — (laughter) — I know I was — I don’t want to go on any longer than I need to. The main message, in addition to just giving — having a chance to shake some hands and give some hugs, is just to say how proud the whole country is of you — (applause) — how grateful we are — how grateful we are that in the face of chaos and tragedy, all of you displayed the very best of the American spirit. You displayed grit. You displayed compassion. You displayed civic duty. You displayed courage. And when we see that kind of spirit, there’s something about that that’s infectious. It makes us all want to be better people. You’ve inspired the entire country. You’ve inspired the world. And for that, you should be profoundly proud. But as Deval and I were talking as we were driving in from the airport, the key is that we hang on to a little bit of that, because it’s right there under the surface every day. And it expresses itself, obviously, in the Marathon. It expresses itself in Patriot’s Day. It expresses itself in all the small interactions, the gestures of kindness and generosity and tolerance and compassion that make up the fabric of our lives. And we don’t always pay attention to it, and we don’t always celebrate, and it’s certainly not usually on a television screen, it’s not always reported on. But that’s who we are. President Barack Obama delivered a message of resilience and recovery as he renewed his pledge that the country would stand by this city still recovering from Monday’s Marathon bombings — and that those responsible would be found. 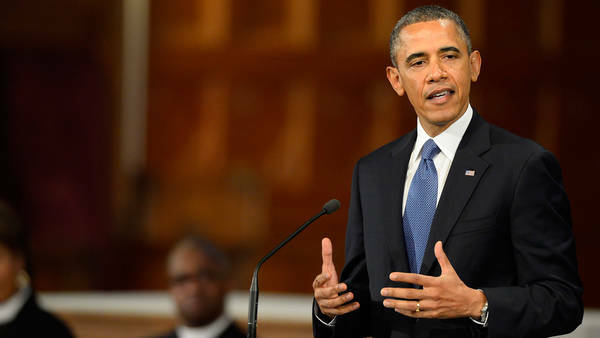 In Boston, Obama Praises Spirit of City: Mourning the victims of the marathon bombings, President Obama spoke at a church service titled “Healing Our City” at the Cathedral of the Holy Cross in Boston. He also praised the spirit of the city. The following is a transcript of President Obama’s remarks at an interfaith memorial service for the victims of the Boston Marathon bombing at the Cathedral of the Holy Cross in Boston on Thursday, as provided by the White House. That’s why a bomb can’t beat us. That’s why we don’t hunker down. That’s why we don’t cower in fear. We carry on. We race. We strive. We build, and we work, and we love — and we raise our kids to do the same. And we come together to celebrate life, and to walk our cities, and to cheer for our teams. When the Sox and Celtics and Patriots or Bruins are champions again — to the chagrin of New York and Chicago fans — (laughter) — the crowds will gather and watch a parade go down Boylston Street. President Obama is scheduled to travel to Boston on Thursday, three days after the deadly bombings at the Boston Marathon. Following a briefing from FBI Director Mueller, Attorney General Holder, Secretary Napolitano, and homeland security advisor Lisa Monaco, President Obama went to the Brady Press Briefing Room to update Americans on developments in Boston, following two explosions at the finish line of the Boston Marathon on Monday afternoon. 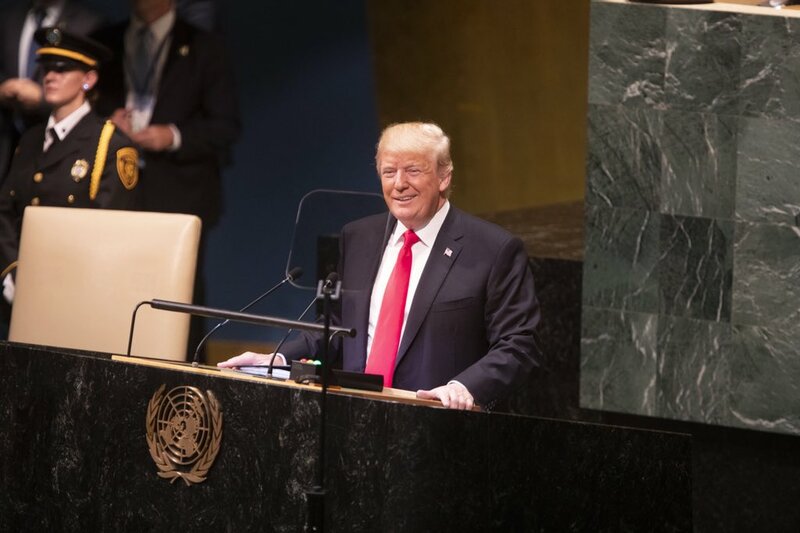 “We continue to mobilize and deploy all appropriate law enforcement resources to protect our citizens, and to investigate and to respond to this attack,” the President said in a televised address. “Obviously our first thoughts this morning are with the victims, their families, and the city of Boston. We know that two explosions gravely wounded dozens of Americans, and took the lives of others, including a 8-year-old boy. This morning the President, joined by Vice President Biden, convened a briefing in the Oval Office with his national security team on the ongoing investigation into the explosions in Boston. Participating in the briefing was Attorney General Eric Holder, FBI Director Robert Mueller, Homeland Security Secretary Janet Napolitano, Chief of Staff Denis McDonough, National Security Advisor Tom Donilon, Assistant to the President for Homeland Security and Counterterrorism Lisa Monaco, Deputy National Security Advisor Tony Blinken, White House Counsel Kathryn Ruemmler, Deputy Chief of Staff Alyssa Mastromonaco, Deputy National Security Advisor For Strategic Communications Ben Rhodes, and National Security Advisor to the Vice President Jake Sullivan. In the briefing, which was led by Assistant to the President for Homeland Security and Counterterrorism Lisa Monaco, the President received an update from Attorney General Holder and FBI Director Mueller on the collaborative efforts underway as part of the investigation, including the agency’s close coordination with state and local law enforcement in Boston. The President also received an update from Secretary Napolitano on coordination underway between DHS and state and local partners across the country to share information, including any additional security steps state and local law enforcement may take. A photo of the briefing can be found HERE.